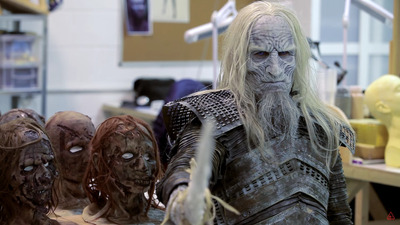 Nerdist/ YouTubeScott Ian was turned into a White Walker by ‘Game of Thrones” prosthetic designer Barrie Gower. While winter is always just “coming,” the White Walkers are actually here on “Game of Thrones,” and their ice-hardened, scary faces aren’t going anywhere. The HBO show’s Emmy-winning prosthetic designer Barrie Gower demonstrated the complexity of the process it takes to turn an actor (actually, a stuntman) into a White Walker in the Nerdist’s latest “Bloodworks” video. In the video, the band Anthrax’s Scott Ian gets the full White Walker treatment. And he’s the first American to become a White Walker. Gower explains that the inspiration for the White Walkers’ look initially came from another popular show, “The Walking Dead.” But, of course, “Game of Thrones” created its own approach for its fantasy world’s zombies. To achieve the White Walkers’ distinct skeletal qualities, Gower says the makeup artists block out the primary forms of the face before adding in texture. At least Ian’s Walker isn’t so scary. Watch the full video below to see the whole process and learn more about the epic battle in the “Hardhome” episode of season five.